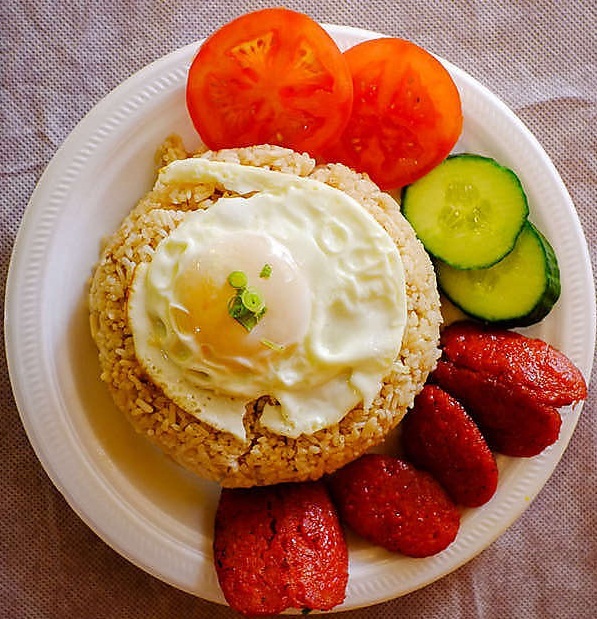 A typical Filipino Breakfast would consist of some meat, garlic rice and an egg. The meat would be a choice of Tapa (Dried or Cured Beef), Longganisa (sweet or salty pork sausage spiced differently by each region), and Tocino (Sweet Cured Pork). For folks who don't eat meat, it is replaced by Tuyo or Daing (Salted Fried Fish). The meat or fish is then paired with Sinangag (Garlic Rice) and Itlog (egg usually cooked sunny side up). Through the years, Filipinos have had a gustatory love affair with the Longganisa, our version of the Spanish sausage or chorizo. Various regions of our country have their interpretations of this very interesting sausage. Ground pork, vinegar, soy sauce, sugar, salt, garlic, and of course, the ubiquitous sausage casings! Truly, the Longganisa is, and has always been, the Filipino’s handy meal-in-a-tube. 1. Mix the pork, vinegar, garlic and pepper in a large bowl. Shape the mixture into cylindrical rolls that are about 1 in (21/2 cm) thick and 3 in (8 cm) long. 2. Place each roll on a section of the caul fat and fold the veil-like membrane over to enclose it. 3. Form sausages in this way with all the meat and caul fat. Season the uncooked sausages with a light sprinkling of the salt. 4. Place the sausages with the overlapping folds of caul fat facing down on a lightly greased skillet and cook to seal them. 5. Cook the sausages for 7–10 minutes, drain on paper towels and serve hot or at room temperature. 6. Arrange your plate with Sinangag first, then put Fried Egg on side and tapa pieces next to it. * Best served with Atchara and Garlic Soy Vinegar Dip.